FREE ESTIMATE. To buy, auction, sell or consign your Rich Buckler art that is for sale, please email Nate@NateDSanders.com or call the Nate D. Sanders Auction House (http://www.NateDSanders.com) office at (310) 440-2982. Please let us know if you have Rich Buckler art for sale. Top dollar obtained for your Rich Buckler art. Rich Buckler was a comics artist who is best remembered for working on Marvel’s Fantastic Four. Another claim to fame of Buckler was drawing almost all prominent characters of Marvel and DC Comics. Bucker created the Marvel comics character Deathlok in 1974 who first appeared in Astonishing Tales #25 and drew all of Deathlok’s initial appearances. He also authored the books How to Become a Comic Book Artist and How to Draw Superheroes. 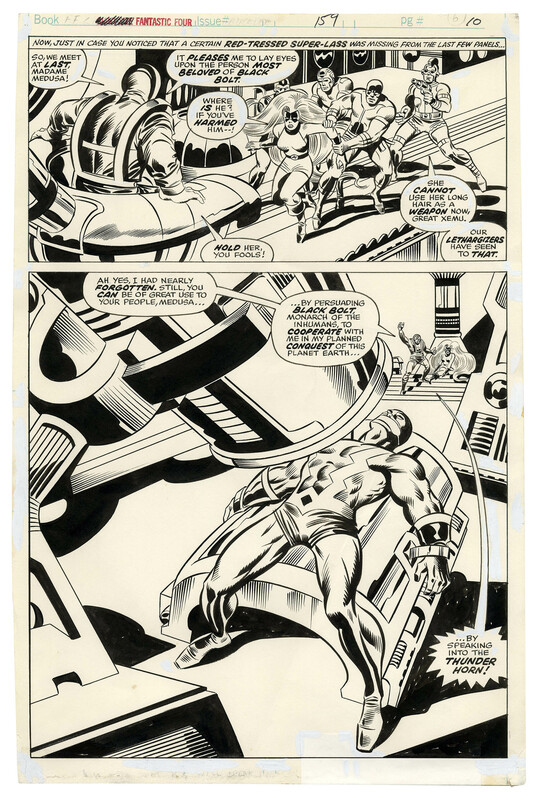 We sold original Fantastic Four Rick Buckler art for $1,100. Please see details below. “Fantastic Four” Original Art by Rick Buckler From 1975 — Xemu Tries to Enlist Medusa to Turn Against Black Bolt﻿. Click to enlarge.